Cheers for the support. 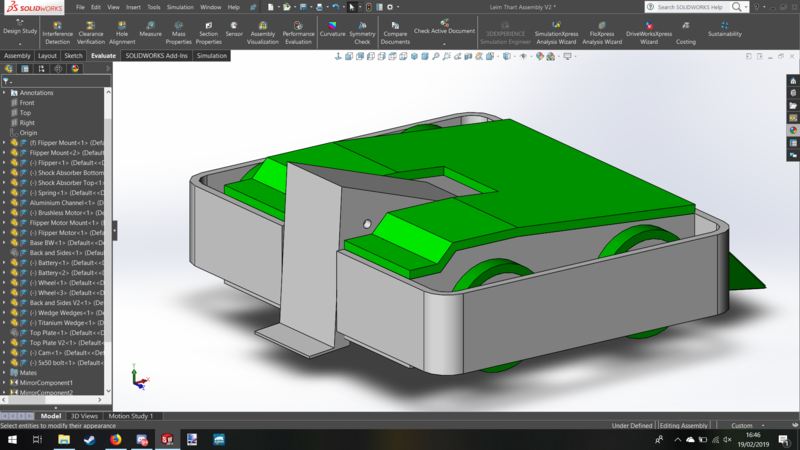 I have many improvements planned for the next version of the bot: four-wheeled drive, brushless, an entirely new shape, and a far more powerful, hopefully actually viable flipper. Will update this post once I've happy with what I can show off. I hope you're going to keep at least one screw the same so you can say it's still the same robot. Look forward to seeing V2! Now that the rest of the Bugglebots specials I was in have come out, I can finally finish off this event report. So even though I was out of the main competition, I was by no means done fighting. My next fight was the Dung Beetle Melee, where all ten competitors without a win in the main competition competed for a "best of the worst" style title. The only notable thing to point out before the fight was that as the melee was filmed early on the final day of filming, the team behind The Berg couldn't make it to the interview beforehand, so I offered to impersonate Charlie in his absence (minus the whole getting dragged out by Tim thing). I've gotten a lot of mileage out of other shirts this event! Just shoved some stuff around really before getting knocked upside down by The Berg, going out at 8th. Not really a lot to add here, just a sucker for consistent formatting. The good news was that the machine could still drive, but the bad news is that the hit from The Berg actually shattered the servo arm that wound the flipper mechanism down, so what little use it had was now gone. Fun fight at least to watch, so I couldn't complain! So thanks to there being a Rest of the World special being hosted as well, I was given one more fight to compete in, and was drawn up against Zero Gravitas. Given how Team International had done so well up until this point, I was nervous going into the fight as now a loss would be disappointing for people other than me. Since the spring flipper mechanism was bust I used a bolt to hold the flipper blade down, and as such so long as I could drive around ZG the 500RPM wheels should allow me to push him. The rest of my strategy was covered in the pre-fight interview, so all that was left to do was to hope for a win in a pushing match. Zero Gravitas decided to wear some red fur on the top of its jaw for this fight, a knowing nod to fellow Irish robot Díotóir, which I thought was cute. I was still having issues with my wires sometimes getting caught in the wheels, but overall I'd say we were even on control. For once the torque-ier motors actually worked to my advantage: ZG could never push me even with a clamp, but every time I got him from the sides or back I could push no problem. A minute in and I get a nice push that nearly pits ZG. A while later and pit shenanigans ensue, with each looking for the right twist that would get the other in the pit. Unfortunately I am unsuccessful, and after a while later I lose drive on one side again. Once I lose drive, I know I've lost my only advantage, so by backup strategy was to shuffle near the pit in the hopes that I could get a cheeky move in that would pit ZG. Fortunately I get a chance, and some iffy driving from ZG leaves them teetering on the edge. Fortunately for me, all of my time driving on one wheel had gotten me pretty well practiced in driving like that, and with some skillful shuffling I was able to pit my opponent, scoring my first beetle win and a clean sweep for Team International! So I was pretty happy with that last fight; I'd say the roughly 9 minutes of roasting Léim got throughout the competition was at least offset by some decent driving at the end there. 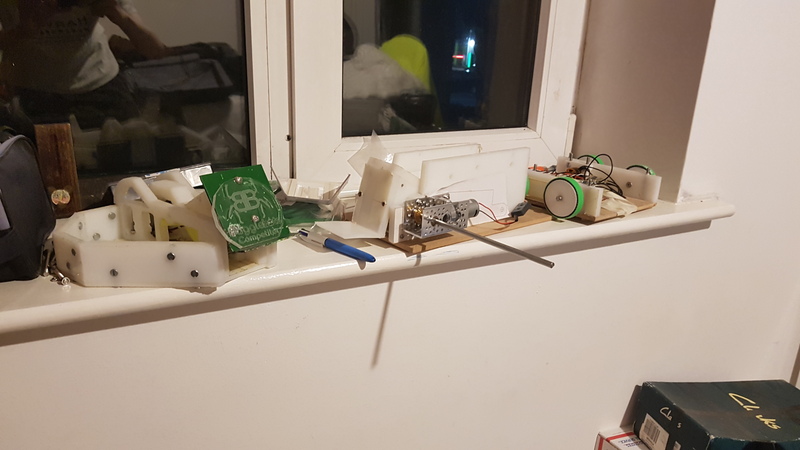 Unfortunately the damage to the drive was a little worse than previously, as one of my motors had actually seized up, as well as one of the ESC's no longer working. It was worth it though, and the fight seems to have gone down well with people, can't complain when you end an event on your highest note! Due to the damage sustained, Léim is now retired. I am considering rebuilding the bot at some time down the line (replace the motors, ESC's), and putting in a beefier servo to at least have a spring system that can at least lift. If I did that I'd even be willing to sell it outright, though I do have other priorities at the moment, so that's on the back burner. I severely underestimated the energy needed to make a viable spring mechanism. The next iteration of the machine will be using a low RPM high torque motor that would put the previous servo to shame. The Banebots hubs consistently failed me over and over. I know of some teams who've modified them to be more reliable, but my next design will use wheels that bypass the hubs entirely. The thing I'm most proud of with Léim was how well built it was structurally. Any damage it sustained was shrugged off completely, and I reckon the machine could take hits from some of the nastiest spinners in the country over and over and keep going the full three minutes if I mounted the electronics and wheels right. The success of Maximum Ogredrive has made me wary of beetle saws in the future, and the next machine I build will aim to bypass them in a creative manner. Overall a very fun event, and everyone there deserves praise. Special thanks to Mark for being pit buddies (congrats on winning btw! ), Alex Mordue for being so friendly and donating 4 brushless ESC's to me, Jeroen and Cosmin for sharing a house during filming and the lifts towards the event, Robert for sharing some of his designs with me, all of the other roboteers, and all of the event organizers for putting on such an incredible event. If there is a second season of Bugglebots, I would be absolutely delighted to return, hopefully this time with a machine that can actually live up to the hype! Not really a lot to add here, just a sucker for consistent formatting. Great write up, and congrats on the last fight. I was properly on the edge of my seat while Léim was single-wheel-jiving over to ZG. Looking forward to seeing what you take to the next Bugglebots! An overview of the CAD. As you can see the design has gone through a complete overhaul. the previous design unfortunately didn't live up to my expectations, and for this machine I had two goals driving the entire project: to have a stronger, more reliable, four-wheeled drive, and to optimize the flipping mechanism to get as much energy as possible from the springs into the flipper. As such, I've forgone the old Díotóir-inspired design for a design inspired by US Beetleweight Butterfly Effect's winding mechanism, and American flippers such as Bronco or Sub-Zero, which aim to reduce the distance between the rams and the flipping blade. 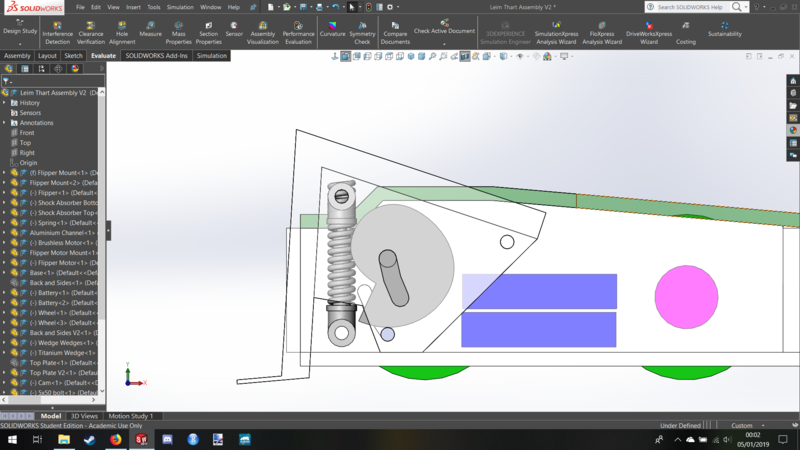 I've scrapped the choo-choo mechanism for a more traditional snail cam mechanism, and have swapped over to using two compression springs mounted on shock absorbers to allow them to hinge. The trick for me here was to design the flipper in a way where a) the springs were as far forward as possible to the start of the flipper for maximum energy output and b) the cam was as far forward as possible so that I could get as much useable torque out of the motor as possible after all other losses (size of the cam, increased forces by being behind the springs etc.). Shots of the flipper mechanism in the wound and fired position. The motor I'm currently using is a Servocity 34RPM Econ Gear Motor (https://www.servocity.com/34-rpm-econ-gear-motor), which has an output of 110.20 kgf/cm, though I may upgrade to the 19RPM model in the future for an absurd +180 kgf/cm. For the mechanism I'm currently using two Flexo Springs 133414 (http://www.flexosprings.com/stock-sp...springs/133414), with a rate of 10.51 N/mm, compressed down to 15mm. I've taken most of my parts for the motor mech from Brandon Zalinsky's US Beetle Butterfly Effect, with the exception of using a snail cam winding method instead of his choo-choo inspired method. For the drive, I was impressed by how much power WeeWoo had at Bugglebots, and after getting some brushless ESC's from Alex Mordue there, I decided to go brushless for Léim Thart. The drive will use 3D printed wheels with hydraulic hosing for rubber grip, and I will be replacing the Banebots hubs with press-fit wheels instead protected by 5mm HDPE. I'm using DYS BE1806 2300KV motors (https://www.banggood.com/DYS-BE1806-...r_warehouse=CN), combined with the Rotalin Planetary Gear Motor's gearbox (https://www.ebay.com/itm/Rotalin-Pla...1-87ca813ef861), with belt drive to drive the front wheels. As well as all of this, the new design will use interchangeable titanium flipper blades, as well as a D2 inspired hinged wedge for the rear for horizontals, though the thickness is entirely down to what I can source. Given how irritated I was at the performance of the bot last year, I decided to segment the build to get all of the new parts of the build working before combining. 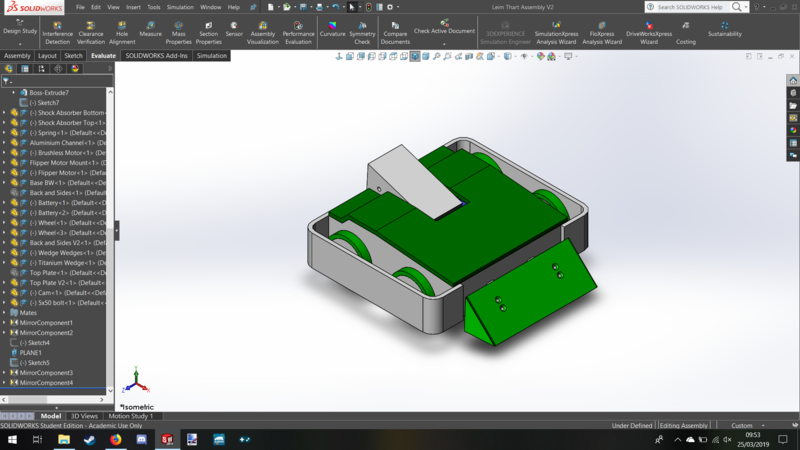 As such, I set myself the challenge to not apply for Bugglebots S2 until I had a) a driveable base for the 4WD brushless drive, and b) a working spring mech that could send the old Léim chassis airborne. The next few posts here will be my build logs for how I got both working, to be written in the coming days. Know now though that I have accomplished both, and have now submitted in my application for Bugglebots 2019. I look forward to publishing all I've done so far. The old Léim chassis along with my flipper and drive base, to be explained in the upcoming posts. That's a really neat design - looking forward to future posts. Also you need to play this song when your robot enters the arena!